Al is one of the most recognisable and successful comics in the UK with his alter-ego, The Pub Landlord. He's joining us at Outside The Box with brand new material! Al has hosted an array of TV series over the last few years: Compete for the Meat (Dave) saw teams battle it out to win the coveted prize of a frozen chicken. His British Comedy Award Winning ITV1 series Al Murray’s Happy Hour has delighted both viewers and critics alike with his no nonsense treatment of his celebrity guests. He is also one of the few stand-up comedians to be asked by ITV to perform two Audience With's.... Al’s sitcom Time Gentlemen Please (Sky One) has become something of a modern day cult classic and his series, Al Murray’s Multiple Personality Disorder (ITV1) saw him introduce a whole host of new characters and demonstrate his vast comedic range. Al’s other TV appearances as The Pub Landlord include 'The McFly Show' (ITV1), three appearances on The Royal Variety Performance (ITV1), hosting both Live At The Apollo (BBC1) and Edinburgh and Beyond (Paramount Comedy Channel) and his edgy quiz show Fact Hunt (ITV1). He has also released six best selling live DVDs My Gaff, My Rules, Glass of White Wine For The Lady, Giving it Both Barrels, Live At The Palladium, The Beautiful British Tour and Barrel of Fun. When can I see Al Murray The Pub Landlord? 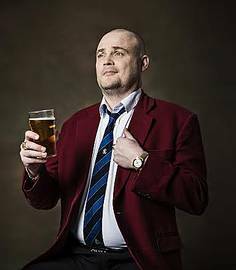 AL MURRAY - Tour Preview, plus support.